On Thursday 27th April, Zone V will launch with a new software and hardware combination to make the smartphone easy to read and simple to use. Large text: Renowned accessibility font ‘Tiresias’ has been used to maximise visibility. Text on the phone is larger than on standard software and adjustable to suit the user. Clear menu: Large icons and intuitive navigation replace existing menus. Vibration feedback: Sensory vibration feedback confirms when icons and keys have been selected to give the user added reassurance. Alternative menu colours: Schemes including black-on-white and white-on-black make the screen easier to read, particularly for those with visual impairment. Easy charger: Magnets on the case and the charger guide the cable, making it easy to plug-in. 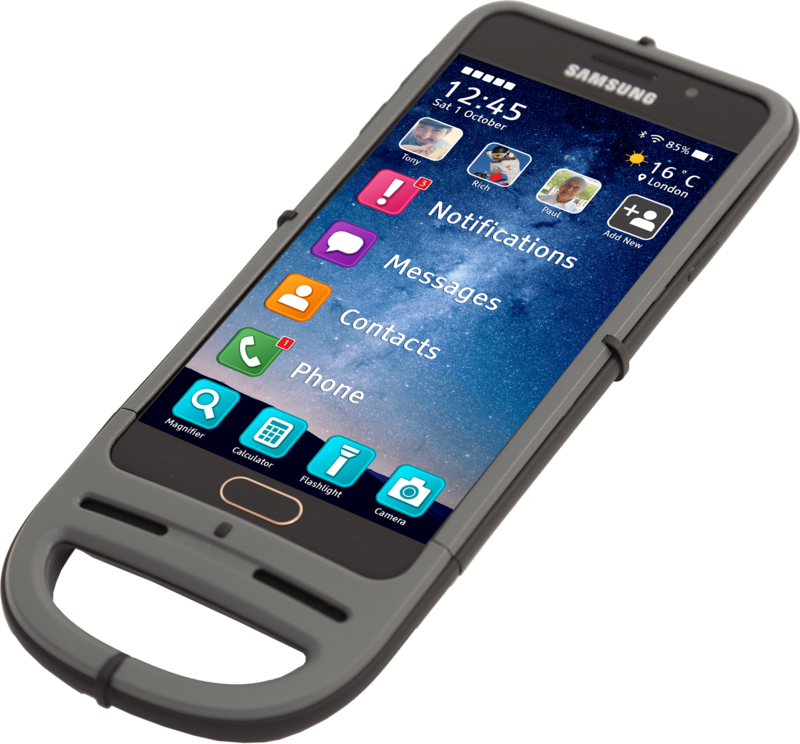 Robust case: Protects the phone from knocks and drops. Magnifying lens: Dedicated lens slides over the camera to form a magnifying glass. Hand grip: Detachable hand loop secures to the end of the case, making the phone easier to hold. Front facing audio: Additional speakers send clear audio out of the front of the phone. New inclusive technology set to simplify the smartphone has been unveiled today by a new mobile entrant. British startup Zone V has designed a unique combination of software and hardware that makes the smartphone easy to read and simple to use. The technology, which is available to buy from today via Google Play store, Amazon and www.zonev.com, will support a range of Samsung handsets to meet the needs of a more mature and less-savvy mobile enthusiast and those with visibility impairment who want to use cutting edge smartphones. Zone V was inspired by the mobile digital divide that exists in society. Despite smartphone penetration in the 55 to 64 age group more than doubling since 2012 (19% to 50%i), there are still millions of adults in Britain who struggle to get to grips with the latest technology. New and extensive research commissioned by Zone V reveals that nearly half (46%) of UK adults over 50 who own a smartphone say they are difficult or complicated to useii. What’s more, 30% of the over 50s don’t have a smartphone at all, with 26% of those saying smartphones are too difficult to even attempt to use. These findings expose the reality that whilst there is a healthy and growing appetite for smartphones within the aging population, there are still many people who feel overwhelmed by the innovation on offer. Rather than dumb-down existing technology to meet this requirement, an opportunity exists to make the high-standards of innovation more accessible. When asked what features would assist the over 50s to use a smartphone, the response was overwhelming – 97% wanted a smartphone that was easy to read and 91% said it must be easy to hold. In the development of the unique and highly-sophisticated product, Zone V studied smartphone innovation in the market and created solutions to enhance and unlock it for a new section of society. The company has worked closely with Samsung to develop products that support and bring to life Samsung’s leading innovation, including that of Samsung Knox, an Android-based solution that offers protection, privacy, and productivity for your mobile life. Zone V’s unique combination of software and hardware offers a range of new and inclusive features that simplify the smartphone, making it easy to read and simple to use, and releasing the cutting edge features of the latest smartphones to a wider audience. “For too long the aging persons’ market has been inadequately served by exciting developments in smartphones. As we age, bits don’t work as well as they used to – eyesight changes and perhaps our fingers aren’t as nimble as they once were. I meet people everyday who have a real passion for the latest tech with a bit of a ‘wow’ factor, but often find that buttons are too small and fiddly and screens difficult to read. Zone V is overseen by former Nokia executives Frank Nuovo and Peter Ashall. Frank is famed for heading up Nokia’s first global design team, overseeing the creation of some of the world’s most recognised handsets including the iconic Nokia 3210. Together with Peter, former Vice President of Concept Creation at Nokia, they launched Vertu in the early 2000s, the first luxury communications company famed for taking technology to a new market. The pair reunited to develop Zone V, running an extensive four-year product development process, involving relentless market and user testing to ensure the product would genuinely change the lives of the people who use it. Development of Zone V has involved a team of international experts across technology through to customer insight. “Today’s mobile industry is full of companies competing to be the first to launch the latest and greatest technology, but there are still far too many people in the world who feel that technology isn’t for them. “There are a great deal of people who want to enjoy the benefits of the latest tech but find it difficult to use. We have built something for them that makes the smartphone easier to read and hold and, overall, much simpler to use. Today’s launch comes with news that the Zone V technology was selected as a finalist in a leading UK technology competition.